Coffee, Tea or Me Too? In my Grandmother’s house, we always had three kinds of “tea”. 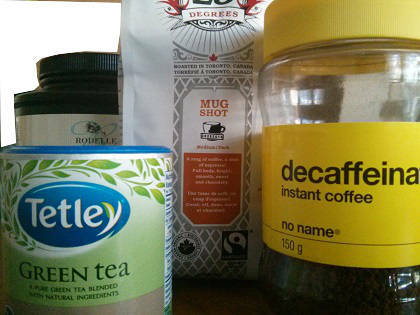 The choices were green tea, coffee tea and cocoa tea. Sometimes, for a treat, we had “milo” tea. Whatever the reason, I preferred “coffee” tea and have maintained that preference ever since. I have now reached the point where I don’t sweat- I percolate and my life’s goal is to amount to a hill of beans. When people call me a “drip” I consider that a compliment. My continuing to drink coffee has nothing to do with some studies that have found coffee to be an aphrodisiac for middle-aged men. I like the taste and smell, although by the fifth or six cup, I hardly notice. Some studies show that caffeine, the stimulant found in coffee, is addictive. After my tenth cup, that hardly matters. What matters is the headache that comes from not having my morning coffee or from my infrequent efforts to stop drinking the stuff. Tea, which is also heavily loaded with caffeine, is not my cup of anything. Coffee is. So much so in fact that Juan Valdez named his donkey after me. My wife once tasted a cup of my coffee and said it tasted like mud. However, as I explained to her, it was ground only ten minutes before. Coffee does not keep me awake at nights. It keeps my wife awake worrying about its effects on my health. She is convinced that it is bad for me and that my arteries are as hard as rock stone and are getting as rigid as my determination to continue drinking fresh percolated coffee. When I say it “perks” me up she cites evidence from every health magazine and research study to show that coffee is bad for me. I tell her that I am so healthy that I can tackle any blue mountain that is put before me. Do I get the shakes, nervousness or irregular heartbeats that my wife is convinced will happen? No and I don’t have diabetes either. Recent research has shown that if you drink several cups of coffee every day you are less likely to get Type 2 diabetes than if you drink any of the other beverages. Coffee has become a gourmet experience bordering on the decadent. According to Fresh Cup, “It is almost a religious experience to watch the roaster sorting through the cooling tray to remove the culls and broken beans, all the while watching the fire box, listening to the beans and trying to keep cool in front of the blazing, crackling machine…Only then can you introduce the beans. You must watch closely as you approach the second pop, and you must dump the beans at just the right time. People who just like coffee find great difficulty in the politically correct world where, in Los Angeles, the waiters ask, “Would you like decaffeinated or non-decaffeinated?” Now it has got even worse. You have a choice of shade grown, bird friendly, eco-OK, fair trade, organically grown and certified organic. You can have cappuccinos and lattes, mochaccinos and espressos to your heart’s detriment if you listen to my wife.